I wasn’t sure what to expect with Dark Rose Valkyrie. My time with Idea Factory games is limited, having been disappointed with the original Hyperdimension Neptunia but enjoying the first Victory. I wondered which experience I would have: disappointment or a pleasant surprise. I can say it was a little bit of both. Similar to Sakura Wars, Dark Rose Valkyrie takes place in an alternate 1920s Japan. However, instead of romancing girls and piloting giant robots, you are romancing girls and warding off an alien virus known as the Chimera Virus. You play the lead of Asahi, captain of the Valkyrie Force who must defeat monsters created by the virus. At his call are a variety of comrades who use a powerful technology known as the Valkyrie System. The plot follows a cat and mouse game between the Valkyrie Force and a group of individuals who want to see the world taken over by the virus. Storywise, Dark Rose Valkyrie isn’t going to win any awards. Some of the bigger plot twists are a tad predictable. Plot progression reminded me of Xenoblade Chronicles X, and not in a good way. Most of the time, in order to proceed further in the plot, you must take on several missions as the Valkyrie Force, such as reclaiming a base from the Chimera or defeating certain enemies. However, these types of missions repeat every chapter, making plot progression repetitive and a bit of a grind. And then you’ll have the moments where the game tells you to go to a place that you have no idea where it is or what direction to go. Since the map only fills out areas you’ve explored already, be prepared to wander a lot unless you are following a guide. However, the saving grace are the characters. Designed by Kousuke Fujishima, character designer of several Tales of games, the cast carry a similar charm to his other work. The Live 2D beautifully bring these characters to life, though the in-game graphics make them look like they walked out of an early PlayStation 3 title. Graphics aside, the characters are charming and grow closer to you the more correct answers you give to their questions. The characters are fleshed out even further when their alternate personalities poke through, a side effect of using the Valkyrie System too much. I was reminded slightly of Shadows in Persona 4, showing a different side of the characters you wouldn’t normally see. 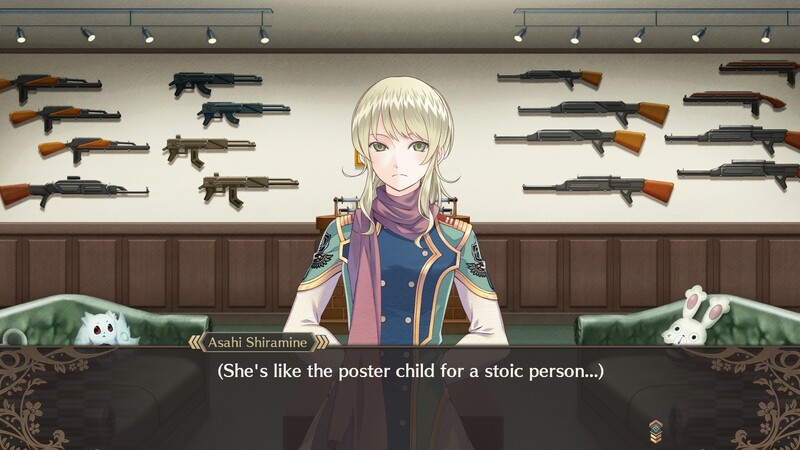 In that regard, I really felt for some of the characters, such as the stoic Yue or the meek Coo. Which makes it more difficult when a traitor enters your midst! 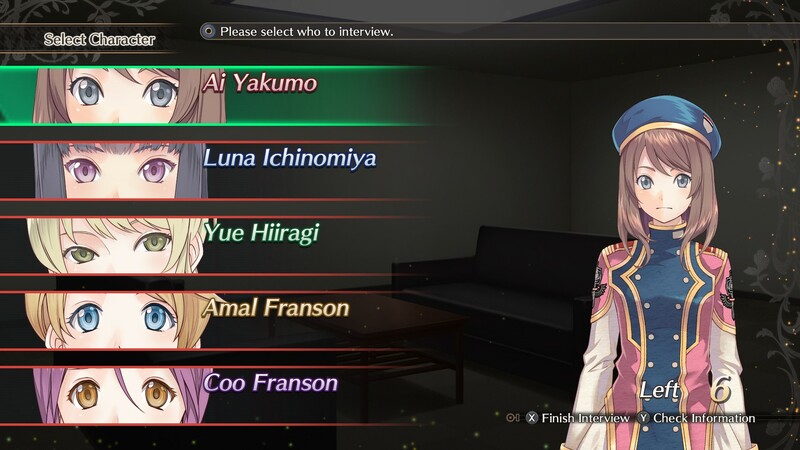 About halfway through the game, the interview mechanic becomes available. By asking your squadmates questions about each other, you can pinpoint who might be a traitor infected with the Chimera Virus. This feature was a lot more in-depth than I expected, and you won’t always get the same results. When I got stuck a few times, it was interesting to look at some walkthroughs and see others with completely different results than me. Speaking of difficulty, Dark Rose Valkyrie can be quite challenging. The game offers you three difficulties: Easy, Hard, and Very Hard. Even on Easy, I still found the game to be a challenge, which is not a complaint in the slightest. 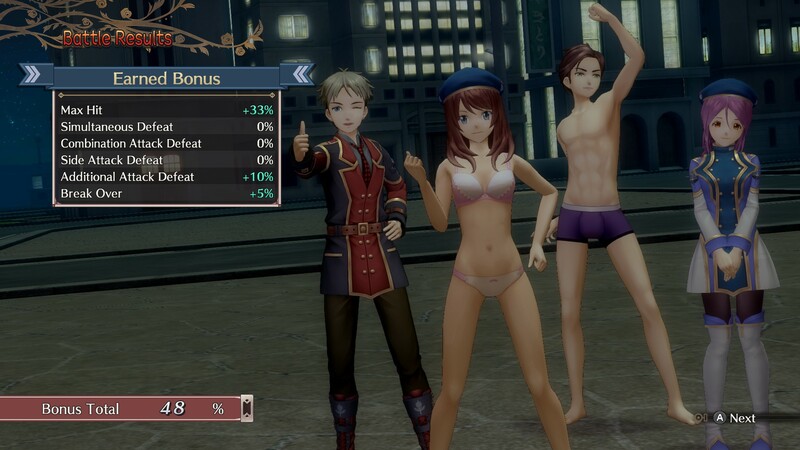 There are a lot of systems to keep an eye on; not only HP and AP for your skills, but there’s also TP for special attacks, the state of your clothes (being in your underwear is actually a bad thing! ), and your stamina. The beginning of the game assails you with an onslaught of tutorial after tutorial, though thankfully everything seems to click after a few battles. The battle system is quite intuitive and engaging. Each character is equipped with a Valkyrie that can be modified in many ways. You can even customize your characters’ clothes, though a lot of your money at the beginning of the game will go to having them tailored back together lest you get pummeled to death in your underwear. Attacks range from melee to several different shooting types. Depending on your preferences, you can make one character specialize in sniper shots while another blasts enemies away with rocket launcher attacks. And when the grind is a bit tedious, a handy auto attack feature is available with the added bonus of a skip button on some of the longer attack animations. Another highlight of Dark Rose Valkyrie is the sound. The score, especially the battle themes, is quite enjoyable to hear. Both English and Japanese voice acting are available. However, I played with the English dub. The voice actors played their respective characters very well, matching their personalities and quirks perfectly. One aspect I didn’t like, which may be the same in the Japanese, was the fact that the character pants every 3 seconds or so of running around the field. It became a bit annoying after awhile to constantly hear these physically fit people pant after only a few steps as if they just ran a marathon. 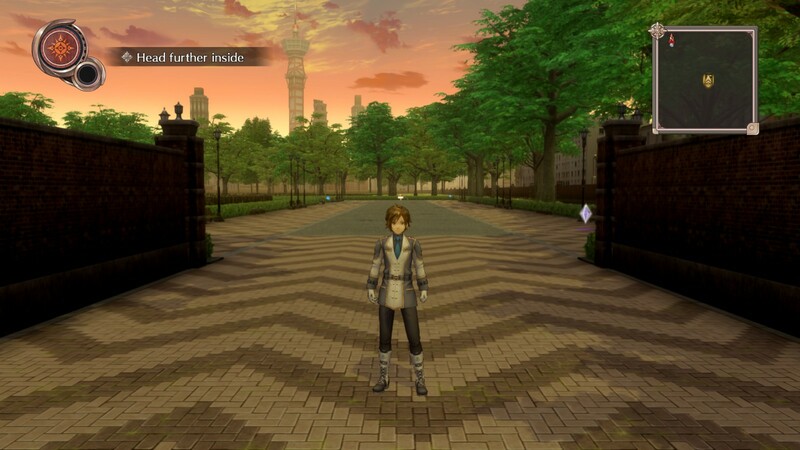 Unlike our original review on PlayStation 4, the PC port is marred by technical issues. Slowdown happens quite frequently, not only on the world map. Battles with a lot of enemies also experience moments of slowdown. Even adjusting my settings to the lowest, the game would still sputter. I even lost some progress when the game crashed on me three separate times. Granted, an update did help a bit, but the slowdown still persisted. Again, Dark Rose Valkyrie is not a pretty game. Most cutscenes use the beautiful Live 2D effect to bring the characters to life, but every now and then a cutscene will use the in-game engine and kill the mood. Dungeon design suffers as well, each road or hallway looking bland as the next. The world map has its charm, but the game loves to play hide and seek with poorly placed trees obscuring objects and treasure. Dark Rose Valkyrie is a decent game. Though the plot can be predictable and unevenly paced, the cast helped push things along. The battle system allowed for lots of customization, though the slowdown definitely mired the experience. The graphics are lacking, but the sound makes up for it with a good soundtrack and solid voice acting. I spent over 50 hours fighting Chimera and it could be more if I decided to pursue more of the game’s multiple endings. 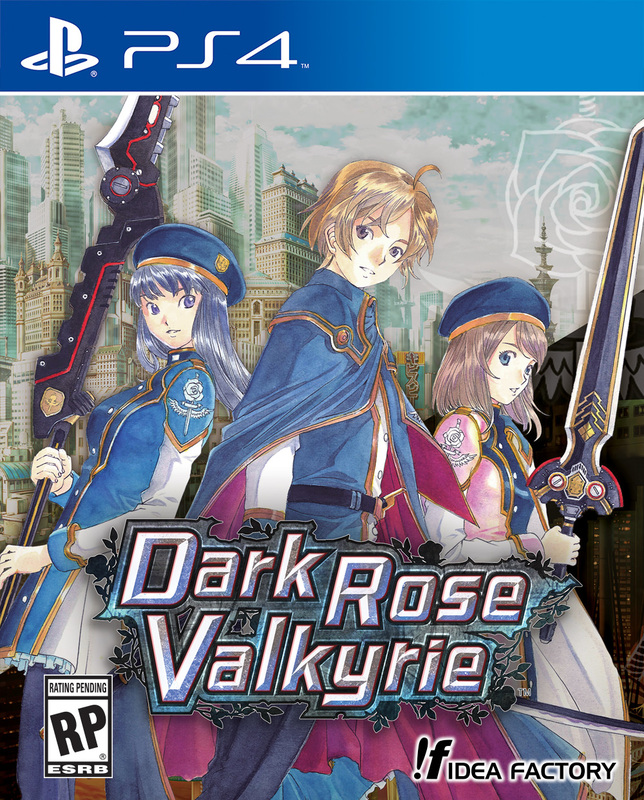 If you are a fan of other Idea Factory and Compile Heart games, you may enjoy Dark Rose Valkyrie, but others might find it a bit too repetitive. If anything, you might want to check out the PlayStation 4 version until the technical issues are better resolved on PC. The game is available on Steam and PlayStation 4 for $39.99. The game was provided by the publisher for review purposes.